From the little I know about vehicles in cities, nowadays concrete is preferred to asphalt for road construction as, while initially more expensive, concrete is supposed to be cheaper to maintain. From a recent reading I understand India also uses asphalt in most places. Why haven't airports switched to concrete? How can I check online the type of material used for passenger commercial airports around the world, especially transit hubs? The runways at Frankfurt Airport are asphalt (old satellite imagery shows that they were concrete before), and the airport handles plenty of Superjumbos, the Airbus A380, so it's not a matter of handling heavy planes. 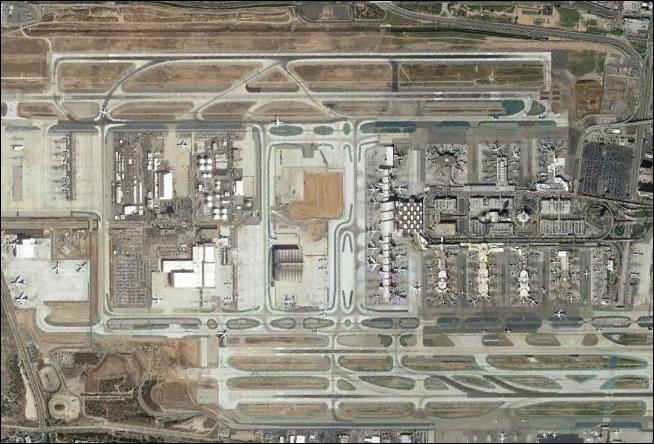 All runways in big airports, even those covered in asphalt, have reinforced concrete foundations that vary in depth. They're deepest where the touchdown zones are located, shallower elsewhere. That's why runway extensions usually just add extra takeoff distance, but the landing zones remain the same, creating a displaced threshold. You'll see almost all the parking spots and holding areas for the runways are concrete, as well as the runway exits. 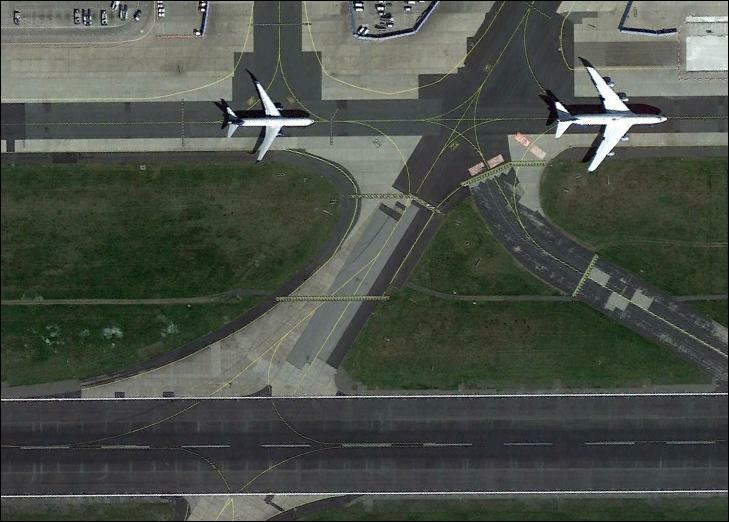 This is where a plane is expected to be stationary. Concrete handles such stationary loads pretty well, while on a warm day the asphalt would deform. Asphalt is called a flexible surface; concrete is called a rigid surface. Pavement classification number (PCN) is a standard used in combination with the aircraft classification number (ACN) to indicate the strength of a runway, taxiway, or apron (ramp). The variables come down to climate, use, load, budget, job creation, maintenance, etc. (NASA) Another point in favor of an asphalt runway, is that it's more gentle on the tires during touchdown (since it's flexible). 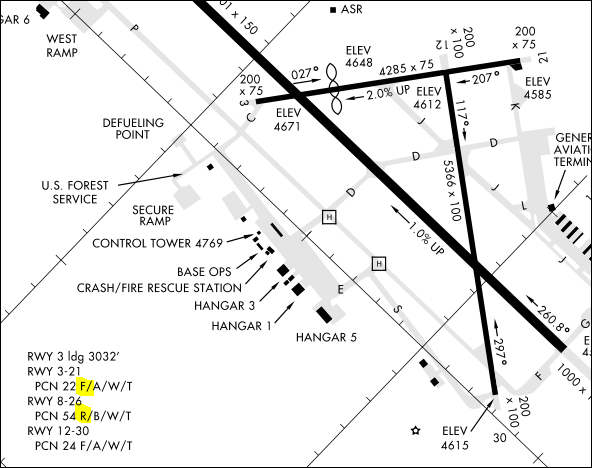 You can find runway data at airnav.com for US airports, elsewhere you'll need to check the airport's AIP, like this one for Amsterdam; check the section 2.12 RUNWAY PHYSICAL CHARACTERISTICS. Or try searching for a nonofficial runway data repository, there could be one. My first reaction to this question was that your assertion of "most" was untrue. Nearly all major airports (airline traffic) use concrete runways. However, according to the Asphalt Pavement Alliance, some 85%+ of general aviation airports use asphalt, and they claim some majors as well. They claim that asphalt is more cost-effective and takes less time to lay down than concrete. So for those airports, where long-term budgets might not be guaranteed, it likely makes sense. 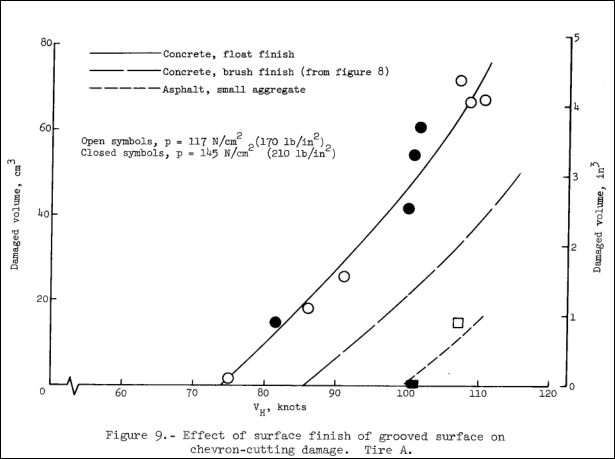 Concrete as a surface is certainly more resilient to traffic in the short term. However the resulting road surface is significantly less smooth. This is very noticeable for European visitors to the US, where concrete is more widely used for road surfaces. In the UK, some sections of motorway were built in concrete in the 1960s, and these are universally unpopular with drivers. To my knowledge, roads in the UK at least are no longer built in concrete for this reason. It perhaps is less of an issue in the US due to the very soft suspension which is standard on US vehicles. Concrete is also very much harder to repair when it develops holes, and those holes tend to be deeper and sharper-edged. Even after repairs, the resulting road surface will never be fully even. This makes concrete less suitable for roads which experience freeze-thaw conditions, namely most of Europe and the northern US. Concrete also has issues with thermal expansion, which makes it less suitable for places which experience high daytime temperatures (or at least this needs to be considered during construction). As ymb1 says, you can put asphalt over concrete though, which gives you the best of both worlds. In most cases, major aerodrome runway pavements are originally constructed using concrete (PCCP). Improvements (resurfacing,strengthening, etc.) on an operational runway are undertaken during off-peak hours (maybe nighttime) to avoid airport disruptions especially if an airport has a single runway configuration. But because of the necessity of runway improvement, asphalt concrete are utilized. Newly laid asphalt may be used immediately after the asphalt curing time. Unlike concrete which cures in the first few days of paving, new asphalt may be allowed to aircraft operations as soon as it is compacted and cool. The runways you have observed may be originally constructed using concrete but resurfaced using asphalt. Asphalt or concrete decisions on FAA sponsored projects are made on life-cycle cost analysis. Sometimes one wins out over the other, but neither is inherently better.